examines the archive as a set of writing and reading practices, seeking to make different meanings than a historian might. The Paper War retells stories found in archives as well as revealing modes of construction, in order to create new narratives. It foregrounds the complexity (perhaps the impossibility) of efforts to establish coherent, credible narratives from partial sources (p.4). This means that, as well as looking at the content of a particular source, she also asks about the source itself : how did this document/series of documents come to be created? What are the institutional structures, and individuals within those structures, that created them? Can we rely on these texts as stable and authoritative guides to the past? (p.4) She is insistent on maintaining this emphasis on text as a mediated material when her reader’s attention might drift into the biographical corridors of chronology and lifestory instead. Her book focuses on the writings by and about Lancelot Threlkeld, the missionary in charge of the Lake Macquarie Aboriginal Mission in New South Wales in the 1820s, a man rather unkindly described as one of the “perpetual blisters” that the London Missionary Society (LMS) seemed “destined to carry”. He certainly seemed a rather pugnacious and belligerent character as a missionary and his writings to attack his adversaries and defend his own position generated what could well be described as a “paper war’. As is often the case, his own irascibility was in response to, and elicited, similar traits in his main clerical adversaries: the equally combative Rev. Samuel Marsden and the protestant cleric John Dunmore Lang. What a combination! I’m particularly interested in this combustible 19th century character type, because our own Judge Willis himself exhibited many of the same traits. Surrounding the Threlkeld/Marsden/Lang sparring ring were representatives of the broader 19th century humanitarian network. Daniel Tyerman and George Bennet were missionary agents charged with overseeing Threlkeld’s establishment of the mission at Lake Macquarie under the auspices of the London Missionary Society and thus his immediate supervisors. James Backhouse and George Washington Walker were peripatetic Quaker investigators whose opinions were valued by metropolitan humanitarian networks for their independence and clarity. 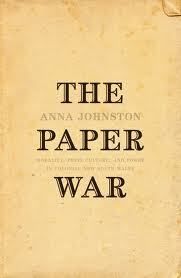 The Paper War is very much embedded in the historiography of the ‘networked’ image of the British Empire (Zoe Laidlaw, Alan Lester, Kirsten McKenzie etc) and these agents and investigators exemplify the way that ideas were circulated throughout the empire by missionaries, intellectuals and London-based groups like the Ethnological Society of London. The book itself has five main chapters, an introduction and a conclusion. The first chapter, ‘Colonial Morality’ gives a brief biographical account of Threlkeld’s career along with the careers of his major protagonists and the circumstances that led to the intersection of their careers with his. The second chapter ‘Colonial Linguistics’, looks at Threlkeld’s pioneering work in researching the language of the tribes surrounding Lake Macquarie, and she traces the evolution in his thinking about how language can be studied and depicted. His earliest work in 1825 was an attempt to develop an orthography (spelling) for an Aboriginal language, mainly in the form of question and answer phrases, strongly based on Europeans assumptions about categories and sentence structure by imposing an artificial one-to-one match between English and Aboriginal words. In 1834 he changed his methodology to investigate the grammar of the language, followed by another work in 1851 written for the Great Exhibition in London called A Key to the Structure of the Aboriginal Language. As was common at the time, colonial collectors were expected to scoop up the raw materials of plants, animals, languages and ethnography, which were channelled to the ‘experts’ in London for ‘proper’ classification and analysis. She traces the use of his work by such ‘experts’, especially the way that it was posthumously re-published and co-opted as part of late 19th century racial theories. Chapter 3, ‘Colonial Press’ shifts its focus to the newspaper record generated by and about Threlkeld, especially in relation to the execution of Tommy, an aboriginal prisoner for whom Threlkeld acted as interpreter. This execution itself became subsumed within a broader sectarian argument, and in February 1828 Threlkeld wrote a series of letters to the editor- a common feature of colonial newspapers- against the Catholic Church. Chapter 4 ‘Colonial Respectability’ takes up Threlkeld’s Statement Chiefly Relating to the Formation and Abandonment of a Mission to the Aborigines of NSW; Addressed to the Serious Consideration of the Directors of the London Missionary Society, written to justify his actions as missionary at Lake Macquarie. Despite its title, it was not aimed at the directors of the LMS alone: he had at least 270 copies printed and distributed it to every director and missionary in the LMS network. It is a 72 page document, largely composed of letters written and received in relation to the Lake Macquarie mission. Threlkeld’s adversary J. D. Lang waded into this documentary swamp with his own series of newspaper articles criticizing the mission and Threlkeld’s character as a missionary, culminating in a civil court case Threlkeld v Lang in 1836. Chapter 5 ‘Colonial Legality’ remains in the courts, but here investigates Threlkeld’s work as an interpreter in the courts, and his position and increasingly critical stance over questions of the amenability of Aboriginal people to British law, the use of Aboriginal evidence and questions of sovereignty. The conclusion of the book picks up themes from the introduction by returning to the question of historians’ uncritical use of the colonial archive. Both Henry Reynolds and Keith Windschuttle as combatants in the ‘History Wars’ share, she claims, a “remarkably simple” view of the archive as unmediated primary source material that can be drawn out to construct a narrative. She picks up on Kevin Rudd’s championing of Thomas Keneally for the background in literary fiction that he brings to his retelling of Australian history (an issue also pertinent with Kate Grenville’s recent works). And here we are returned to the question of the heart and the affective world so prominent in the humanitarian world view, including that of Lancelot Threlkeld. As I mentioned earlier, I was particularly interested in the structure of this book for my own work, given that it takes an documentary archive deeply imbued with questions of personality and temperament. I ‘m interested by the decision to place Chapter 2 where it is- perhaps because Threlkeld’s linguistic work has been somewhat overlooked?- because it seems more related to Chapter 5. I’m impressed by the way that her strong, minimalist chapter structure forces the reader’s attention on the form rather than the content of the archive. The book is on one level about Threlkeld , without being a biography as such, but on another level it works on a much larger canvas. You can download a generous extract of the book here. This entry was posted in Australian history, Australian Women's Writing, Book reviews, Colonial biography, Historians, Settler colonialism. Bookmark the permalink. Thank you for this. I’ve just downloaded the extract, and it looks well worth reading – but I’m a bit puzzled. You say chapter 1 is on ‘Colonial Linguistics’, and wonder why she put that chapter first – but unless I’ve missed something through only reading that extract, the first section is ‘Colonial Morality’ from pp. 15 onwards, and that seems a sensible place to start, with Humanitarian Networks in the British Empire – it also allows her to introduce the LMS, bring Lancelot to Australia, deal with his wife’s death, and his withdrawal from Polynesian missionary activity. So – again on only a brief reading of the extract – it looked more conventionally chronological in its form than your synopsis suggested. Good luck with your own biography – Willis is a fascinating figure, and I really look forward to reading your work. Thanks for bringing this to my attention- I realized when I looked at the original posting that I’d skipped the first chapter ‘Colonial Morality’ completely! One might have hoped that I’d realize that I was missing a whole chapter when I looked at the table of contents, but maths was never my strong point. I have your book on Benjamin Boyd on my bookshelves, hoping one day to move it from “to-be-read” status to “just read and enjoyed”. He must be King of the Fascinating Characters! Thanks for this review. I have read a bit about Threkeld and he strikes me as being quite difficult to get along with! I have a large pile of unread books/articles but your review has made me curious about this book. In particular your discussion about how “Her work is not history, or biography, but a literary/cultural study” etc has me puzzled. You go on to talk about how Anna Johnstone questioned the circumstances in which the documents she was using came to be created. In my experience this is exactly what historians do. Some historians do write histories that are literary/cultural studies – these are recognised as histories. I understand the need that Anna Johnstone has to distinguish her work and methodology from others but this artifical demarcation between historical genres does not resonate with me. I think that she was emphasizing that she was approaching him through the lens of his written output as the focal point, rather than investigating him as a starting point and building a biographical study from the archive. But, as you say, it’s not a hard distinction, and as you flip through the book, it’s not easily distinguishable from a book that would describe itself as ‘history’. After the first chapter, the middle chapters are organized around writings of different genres- grammars/letter-to-the-editor-debates/published pamphlet, and I think that it’s the emphasis on language that differentiates the book. Throughout the book there is a reference to a bedrock of theory about texts and culture amongst which I found myself feeling rather inadequate- I realized that she was bringing different interests and theoretical background that moved beyond a discussion of methodology and problems of the archive. Ok – this book is now on my list of ‘must’ reads! Plunge in anywhere, just backup your files often and store a copy once a week in a friends house. Oh, what a terrifying thought!! My readers (such as they are!) raising a judgmental eyebrow at my lack of progress! It’s bad enough – as you say- squirming in front of one supervisor! Great review and discussion – I like the way you’ve teased out her approach in this book RJ. Sounds like the sort of thing I like to get my head around but from very much a lay perspective. Btw, re backup. Have you heard of Dropbox? Free software that enables you to store and share stuff in the cloud? Also good for backup. You might like to check it out – google it, ask others whether it’s recommended for your needs, etc. Yes, thank you- I’ve heard of Dropbox, and I’m using Sugar Sync which is much the same deal. I think you’d be interested in the book as a librarian because it straddles the history/archive line.